Beat the Blaze encourages fire safety awareness in a fun, engaging, and interactive way. 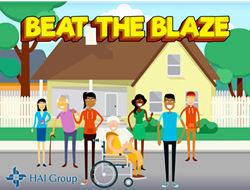 HAI Group, a national provider of innovative solutions tailored for the public and affordable housing industry, is proud to announce their first ever fire safety learning game, Beat the Blaze, just in time for Fire Prevention Week! HTVN, HAI Group’s e-Learning Solution, and the internal Risk Control and Consulting Team partnered on Beat the Blaze with the goal of increasing fire safety awareness for HAI Group’s member housing agencies. Housing professionals and residents can challenge themselves to learn more about fire safety by answering questions to escape the house; trying to beat the clock, avoid obstacles, and out-score friends. The learning experience is fun and competitive at the same time; the more you play, the more you learn. The National Fire Protection Association is observing Fire Prevention Week from Sunday, October 8 to Saturday, October 14, 2017. This year’s Fire Prevention Week theme, “Every Second Counts: Plan 2 Ways Out!” works to better educate the public about the critical importance of developing a home escape plan and practicing it. Beat the Blaze is a perfect way to bring awareness to this year’s theme. As gamers play Beat the Blaze, their knowledge is tested on smoke alarm maintenance, fire safety plans, common causes of home fires, and much more! To play Beat the Blaze for free, please visit http://www.housingcenter.com/beattheblaze. For additional fire safety training, HTVN offers a Fires and Resident Safety Learning Pathway, which is available on http://www.htvn.org. HAI Group is a family of companies founded by and dedicated to serving the public and affordable housing community. We deliver innovative, tailor-made solutions to protect assets, improve efficiency, empower employees, and move housing strategies forward. The company’s continued growth since 1987 and diversification into areas where members have identified needs, demonstrates the company’s commitment to their more than 1,400 stakeholders. HAI Group’s portfolio includes insurance, capital, research, advocacy, and learning solutions. Headquartered in Cheshire, Connecticut, HAI Group’s membership extends across the United States. For more information, visit http://www.housingcenter.com.